Actually, the pairing proved to be an excellent one at a stimulating pair of string quartet concerts at Zankel Hall, a smaller venue in the bowel of Carnegie Hall. On Friday, October 21, the Belcea Quartet flanked Shostakovich’s String Quartet No. 8 with the early Schubert String Quartet in E-flat Major, D.87, written when he was 16 years old, and his String Quartet in G Major, D.887, written 13 years later, in 1826. But then, everything is early in the career of a composer who died at 31. It’s mind-boggling that such polished work could be composed by an artist in his teens, and the later one in his late twenties, some 800 works separating them. The E-flat Major quartet may not have the depth of its later sibling but the Belcea Quartet gave it their all; it’s a very physical group, the violins and viola players swooping in their chairs, waving their bows and attacking their instruments with vigor. Their committed playing made a convincing case for the piece, highlighting the zippy Scherzo and the flowing melodies throughout the work. The G Major quartet featured more of the angular playing, with drama replacing the warmth we often hear in other interpretations but at the same time negotiating transitional sections with aplomb and morphing a playful tune into slashing streams of fortissimo. The Quartet is led by the eponymous first violinist, Corina Belcea, in a graceful light-colored gown and whose male colleagues wore black outfits with red piping on their jackets and stylish leg-hugging pants; the result, however, made them appear to be in military-academy uniforms or as ushers in an upscale movie house. The Shostakovich Eighth is the most-often played of his 15 string quartets. It dates from 1960, the five movements played as one, with the first section a Largo full of quiet intensity, followed by a frenzied, agonized section that strikes the listener like an out-of-control, unstoppable train and followed by a pair of Largo sections that fade away in an exhausted pianissimo. Another Shostakovich quartet, the last of his 15, dating from 1974, opened the Danish String Quartet’s superb concert at Zankel Hall on October 26. To call it funereal is an understatement. Its six movements are soaked in sadness, like a dirge for the brutal dictatorship that was inflicted on the people and on the Soviet Union’s greatest composer himself. Shostakovich was a sensitive artist whose life was bleakly stamped with fear – the prospect of imminent hammering on the door in the middle of the night by the KGB. All six movements are marked Adagio, one of them a funeral march, and all were played with sharp focus and tonal leanness. Shostakovich’s constant feelings of vulnerability suffuse the work, its poignant revelation of its creator’s paranoia (sometimes paranoia is justified) audible in every bar. Not exactly a fun piece (except for the brief allusion to klezmer music). With its abundance of broken waltzes and dark passages, even the Serenade movement is less a serenade than a warning signal of danger. After Intermission (a breather is necessary after the grim Shostakovich work) the Schubert String Quintet in C Major, D.956, in my not-so-humble opinion his greatest single work, received a superb performance. 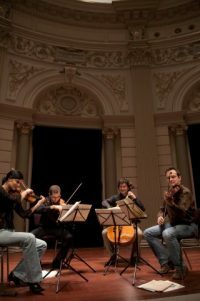 The Quartet was joined by a second cellist, Torleif Thedéen. Its four movements overflow with melodies and invention. The Danish players captured the work’s depths with rhythmic steadiness, bold climaxes, and technical facility. Special kudos must be made for the violist, Asbjørn Nørgaard, whose dark, warm tone in exposed passages was captivating. While leaving the auditorium I overheard someone complaining that the performance “wasn’t Austrian enough.” He may have been expecting a sequence of schmaltzy waltzes; suffice it to say that the performance was equal to the music – a masterful performance of timeless great music.